Even picky eaters will love this cute lunch idea that you can customize with their favourite sandwich fixings. 1. Using your knife, cut your 2 slices of white bread into an oval shape. Try to use only the bottom half of the bread. 2. Cut a head shape out of the remaining bread. 3. Grab your lunch meat and cut a small oval shape out, as well as some udders. Use the remaining lunch meat to fill up your sandwich. Place the sandwich body and head on your plate. Place the small oval lunchmeat on the cow’s face and the udder underneath the cow’s body. 4. Flatten your crusty piece of bread and cut small pieces out of it for the cow’s spots. I used a tiny cutter I had, but you could use a knife too. Place these spots on your cow sandwich, leaving one leftover for the tail. 5. Take your slice of cheddar cheese and cut 2 horn shapes out. Place these on top of your cow’s head. 6. Grab your small slice of apple and cut out 4 legs and 1 tail. Place these on your cow. You can add your last crust piece to the cow’s tail too. 7. Place 2 currants on the lunch meat on the cow’s face for the nose. 8. Take your 2 icing eyes, and place these on the cow for the eyes. 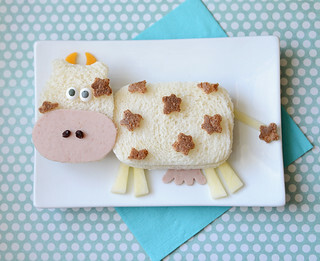 This cow sandwich is so cute and so fun, your kids will find it udderly irresistible! Enjoy! Jill Dubien is a working mom who loves to craft and cook with her kiddos in her spare time. She has an awesome and supportive husband and two wonderful kids. Before she had kids, Jill couldn’t cook much of anything except toast and cereal, and really despised being in the kitchen. Jill blogs at Meet the Dubiens, where she shares lots of fun foods and crafts for kids. You’ll find more of her cute recipe ideas here.